It is now well established that the earth's upper mantle is the source of the basalt magmas erupted by many volcanoes as lava flows1--for example, Kilauea Volcano, Hawaii. The earth's crust is predominantly of a granitic composition, whereas the mantle is closer to a basaltic composition. Pieces of mantle rock are often brought to the earth's surface in basalt lava flows. Other evidence also confirms that the basalt magmas are generated by partial melting of the upper mantle rock. Where such volcanic eruptions occur on the continents, the basalt magmas typically have to ascend some 60-80 kilometers (35-50 miles) from the upper mantle to the surface. Furthermore, the mechanisms by which magmas ascend and the rates of magma ascent are known to play a critical role in the dynamics of volcanic eruptions, but these phenomena have until now been poorly constrained. Critics of catastrophic Flood geology have thus used the presumed long, slow ascent of basalt magmas, and their uniformitarian extrapolation back into the past of the small volumes of basalt magmas delivered to the earth's surface today, to insist that many millions of years of eruptions would have been needed to produce the basalt lavas found in the geologic record. However, the ascent rate of the gas-rich, explosively erupted kimberlite magmas that host diamonds has previously been determined as four meters per second (about 787 feet per minute or nine miles per hour)!2 Such a rapid ascent rate is crucial to survival of the diamonds carried by these unusual magmas from 200-400 kilometers (125-250 miles) down in the mantle up to the earth's surface. A slower ascent rate would result in the diamonds turning to graphite. To put this ascent rate into perspective, it only takes between 12 and 30 hours for the diamond-carrying kimberlite magma to travel from 200-400 kilometers depth in the mantle up to erupt at the earth's surface (Figure 1). Small amounts of water have been found dissolved as hydrogen and hydroxyl ions (the dissociated components of water) in the minerals within fragments of mantle rocks (xenoliths) brought to the earth's surface in basalt magmas.3 Even those small amounts have major effects on physical and chemical processes in the mantle, also being critical to plate tectonics.4 Furthermore, experimental studies have shown that this water dissolved in mantle minerals would likely be partially lost during transport to the earth's surface, being partitioned into the ascending magma.5 Consequently, measuring the water still dissolved in such minerals within xenoliths in erupted basalts could provide clues to quantifying magma ascent rates prior to eruption. Such a study has now been undertaken.6 Olivine crystals were separated from garnet-bearing mantle xenoliths within the Quaternary (post-Flood) alkali olivine basalt flows of Pali-Aike, Chile,7 for Fourier Transform Infrared at the centers of the mineral crystals in these xenoliths indicate that these pieces of mantle rock were originally under temperature and pressure conditions corresponding to a depth of 60-80 kilometers.8 Furthermore, there is no geophysical evidence below these lava flows of a magma chamber in which the xenoliths could have been stored for an extended period and become equilibrated with their host magma during transport from the mantle to the earth's surface. The alkali basalts hosting the mantle xenoliths erupted at a temperature estimated to have been between 1200ºC and 1290ºC.9 Furthermore, FTIR measurements of the visible clinopyroxene crystals (phenocrysts) in the basalts show no evidence of hydroxyl (OH) incorporated in them. This, together with the absence of amphibole, indicates that the basalts were undersaturated in water, making the basaltic magma which transported the mantle xenoliths an effective "sink" (or potential receiver) for hydrogen. An environment thus existed in which the mantle xenoliths could have become progressively dehydrated during magma ascent, and in proportion to the rate of ascent. Profiles of FTIR measurements across individual grains in the mantle xenoliths revealed that the water distribution in the pyroxene grains was homogeneous, in contrast to the olivine grains where their rims were hydroxyl depleted.10 In total, thirty olivine grains were studied, and all olivine grains larger than 0.8 mm across had hydroxyl-depleted rims. Additionally, profile measurements were repeated on two of the olivine grains while crystallographically oriented, because it is known that hydrogen diffusion in olivine is related to its crystal structure. These measurements confirmed that the rims of the olivine grains in the mantle xenoliths were hydroxyl-depleted. This indicates that this olivine was dehydrating in the water-undersaturated host basalt magma as the mantle xenoliths were engulfed by it and transported up from 60-80 kilometers depth to the earth's surface. Using experimentally-determined diffusion coefficients for hydration of olivine,11 water diffusion profiles were calculated for all three crystallographic axes of an olivine grain at a temperature of 1245±45ºC for various durations, with an initial water content of ~312 weight parts per million (wt ppm) and a final water content of 0 wt ppm at its rim. Thus it was possible to approximate the ascent rate of the mantle xenoliths and, by extension, their host basalt. The calculated ascent rates ranged from 1.9 hours at 1290ºC to 3.4 hours at 1245ºC and 6.3 hours at 1200ºC. Furthermore, FTIR analyses across cracks in the olivine grains did not exhibit any perturbations of the hydrogen profiles, so hydrogen diffusion from the grain rims occurred predominantly prior to the cracking of the grains near the earth's surface or after the eruption of the host basalt. Therefore, these mantle xenoliths must have reached the earth's surface in a matter of only several hours. Assuming a depth of origin for the xenoliths of 60-80 kilometers, the corresponding ascent rate is 6±3 meters per second (13.5±6.5 miles per hour). Because these xenoliths are denser than the host magma, this estimate gives a minimum ascent rate for the host alkali basalt magma. That equates to this basalt magma only taking between two and eight hours to travel from the upper mantle to erupt at the earth's surface. Such a rapid ascent to the earth's surface is consistent with the freshness of these xenoliths and is similar to the ascent rate of four meters per second determined for volatile-rich kimberlite magmas containing diamonds. Any claim that the eruptions of basalt lava flows are a timescale problem for the Genesis Flood on a young earth can now be easily dismissed. If it only takes basalt magmas between two and eight hours to travel from their upper mantle sources to erupt through volcanoes at the earth's surface, then many basalt volcanic eruptions could have easily occurred during the Flood year. Furthermore, the volume and scale of the basalt lavas found in the geologic record, such as the so-called flood basalts of the Deccan and Siberian Traps,12 testify to the global catastrophism operating in the Flood year, in contrast to today's occasional, small, and relatively insignificant basalt eruptions. The bigger question is how so much of the upper mantle rock partially melted quickly enough to generate those enormous volumes of flood basalts. 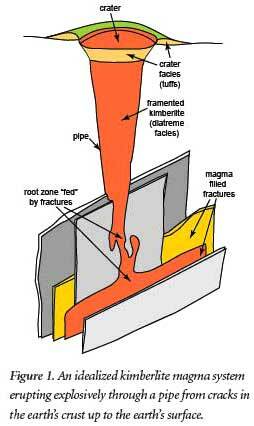 However, during the Flood year the pre-Flood ocean floor ruptured into plates that sank into the mantle via thermal runaway subduction, the resulting mantle-wide convective flow generating huge mantle plumes and rapid melting of enormous volumes of upper mantle rock beneath the mid-ocean rift zones.13 Thus catastrophic plate tectonics during the Flood is the only viable explanation for the many basalt flows found in the earth's rock record. And this new experimental evidence confirms the rapid ascent and eruption of basalt lavas, consistent with the Biblical framework of earth history. Hall, A. 1996. Igneous petrology, 2nd ed. Harlow, England: Addison Wesley Longman Ltd.
Bell, D. et al. 2003. Hydroxide in olivine: A quantitative determination of the absolute amount and calibration of the IR spectrum. Journal of Geophysical Research 108 doi: 10.1029/2001JB000679. Hirth, G., and D. L. Kohlsedt. 1996. Water in the oceanic upper mantle: implications for rheology, melt extraction and the evolution of the lithosphere. Earth and Planetary Science Letters 144:93-108. Regenauer-Lieb, K., et al. 2001. The initiation of subduction: Criticality by addition of water? Science 294:578-580. Ingrin, J., and H. Skogby. 2000. Hydrogen in nominally anhydrous upper-mantle minerals: Concentration levels and implications. European Journal of Mineralogy 12:543-570. Demouchy, S. et al. 2006. Rapid magma ascent recorded by water diffusion profiles in mantle olivine. Geology 34:429-432. Stern, C. R. et al. 1999. Evidence from mantle xenoliths for relatively thin (<100 km) continental lithosphere below the Phanerozoic crust of southernmost South America. Lithos 48:217-235. D'Orazio, M. et al. 2000. The Pali-Aike Volcanic Field, Patagonia: Slab-window magmatism near the tip of South America. Tectonophysics 321:407-427. Demouchy et al., ref. 6. Kohlstedt, D. L., and S. J. Mackwell. 1999. Solubility and diffusion of "water" in silicate minerals. In Microscopic properties and processes in minerals, ed. K. Wright and R. Catlow, 539-559. Dortrecht, The Netherlands: Kluwer Academic Publishers. Jerram, D. A., and M. Widdowson. 2005. The anatomy of continental flood basalt provinces: Geological constraints on the processes and products of flood volcanism. Lithos 79:385-405. Austin, S. A., J. R. Baumgardner, D. R. Humphreys, A. A. Snelling, L. Vardiman, and K. P. Wise. 1994. Catastrophic plate tectonics, In Proceedings of the Third International Conference on Creationism, ed. R. E. Walsh, 609-621. Pittsburgh, PA: Creation Science Fellowship. 289:609-611. 6:3-25. Cite this article: Snelling, A. 2007. The Rapid Ascent of Basalt Magmas. Acts & Facts. 36 (8): 10.